Billions, zillion, trillion times numberless thanks to you for working with your body, speech, and mind in the center for fifteen years. The purpose of the center’s existence is for the teachings of Buddha. And the teachings of Buddha are for the happiness of sentient beings—to free them from oceans of samsaric suffering, from the six realms, to bring them to peerless happiness, the complete cessation of obscurations and complete realization. You should recognize your service is like limitless skies of benefit. What you are working for are the teachings of Buddha—the Lesser Vehicle teachings, the Greater Vehicle teachings, sutra and tantra, the path of the Buddhadharma—that benefit sentient beings: numberless hell beings, hungry ghosts and animals; numberless sentient beings in the ocean and in the mountains; some we can’t see with our eyes; some we have to see through a machine; some that live in the ground; tiny insects walking in the grass, running everywhere in the grass; beings in the bushes and in the sky. You are benefiting every mosquito, every ant, every tick, every maggot, and so forth; numberless human beings; numberless suras, asuras, and intermediate state beings. And there are numberless universes, not only this one. You are benefiting all those different sentient beings. In the morning when you come to work, think this: “I am going to work for all sentient beings, to free them from oceans of samsaric suffering and to bring them to peerless happiness.” That’s the motivation for all day long for body, speech, and mind—it doesn’t matter what you do. Of course, because you have received teaching from little me, Mickey Mouse, we have the connection of Dharma and the relationship of guru and disciple. It is said in the root Kalachakra tantra that even if in all past, present, and future eons, at all times, you make offerings to Buddha, Dharma, and Sangha, even saving ten million creatures’ lives from being killed, you won’t achieve enlightenment in this life. But, by pleasing with devotion a guru who has an ocean of knowledge, then you can achieve common and sublime realizations, including enlightenment, in this life. That’s what you are doing! Another quotation from the tantra of Yeshe Gyatso (“Ocean of Tantra Wisdom”) says that the person who is wise in activities and service to the guru, that fortunate being has a more meaningful life than having done prostration to the ten directions’ buddhas (that means numberless buddhas), for 10 million eons and 600 thousand eons. If one fulfills all the advice given by the guru, then all one’s wishes get fulfilled, and one achieves unfathomable limitless merit and good luck. Sakya Pandita, one of the five great Sakya lamas, from where the Sakya lineage comes, said that even the merit collected from thousands of eons of making charity to others with your head, legs, and hands, even the merit collected from that, is not as much as the merit collected in one second on the path of the guru, which means fulfilling the guru’s wishes, following the guru’s instructions, and giving service to the guru. Each second you do that you are able to collect extensive merit. What you would have collected over thousands of eons, here, you collect in one second. That means every year, every month, week, day, hour, minute, and second that you are doing things for me, following my wishes and advice, you are not only collecting that much merit and good luck, you free yourself quickly from oceans of samsaric suffering. Every second you become closer to enlightenment, to buddhahood. This is such a quick way to achieve enlightenment. You should remember this every day with the work of your body, speech, and mind. Therefore, every day and every night, you should enjoy your life and how you’re making your life most great. Remember this especially when you are going to die. The extremely learned actualized holy being Mig Pemba said that if one thinks the Buddha is in front of oneself, the Buddha abides in front of oneself, and the Buddha always blesses the mind of oneself and liberates it from all the mistakes—not only suffering and negative karma, but all the delusions and obscurations. That means for the disciple who thinks the guru is Buddha, then Buddha is always in front of that person, and the benefit that person receives is total cessation of all obscurations and total and complete realization. Nagarjuna, like a second Buddha, spread the Buddha’s teachings. He abandoned all the offerings to Buddha, but attended perfectly and made offering perfectly to the guru. Service with one’s body, speech, and mind, fulfilling the wishes and advice of the guru, this is how to make the most of one’s life. I don’t know how many years, months, weeks, hours, minutes, seconds you have, but life is very short. And you are making the best use of it, not only for yourself, but for all sentient beings. So I’m truly expressing my heart to you. Thank you very much again a billion, zillion times. I heard from Geshe-la how you worked so perfectly and successfully. You can enjoy this up to enlightenment and even after enlightenment. When you see an insect, you should think what benefit you are giving it. Transcribed by Ven. Thubten Osel, May 2016. 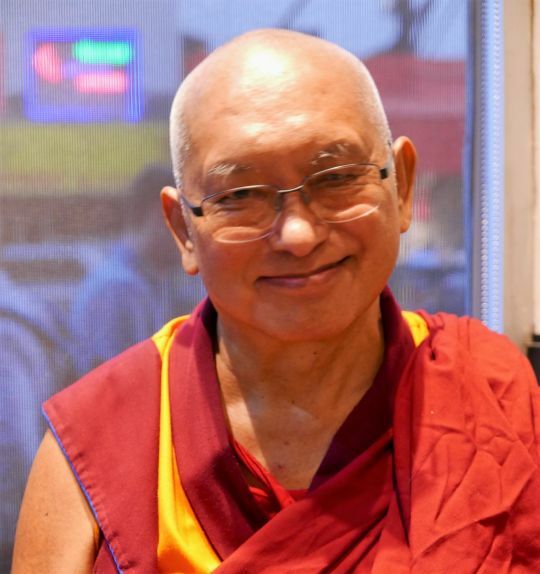 Edited by Mandala for inclusion on FPMT.org.